The hectic month of May is finally coming to an end. 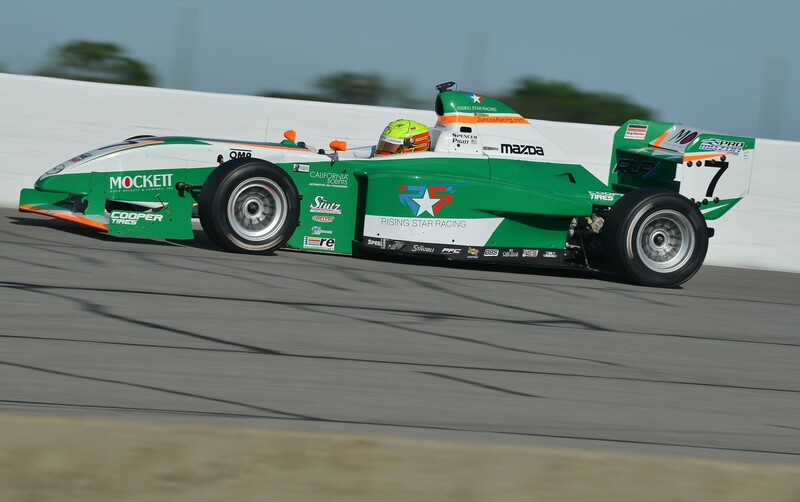 We had three races in the Pro Mazda Championship, two at the Indianapolis Motor Speedway and one at Lucas Oil Raceway for the “Night Before the 500” event. The month started at the IMS road course for the inaugural Grand Prix of Indianapolis. It was pretty cool to be racing inside the speedway, it wasn’t the historical oval but still a very special place to race. The GP was going really well up until the races. I qualified on pole by the biggest margin of the year, almost 4 tenths of a second. Looking back at it, qualifying 3rd or 4th might have actually been better. The front straight is so long at IMS I was a sitting duck out front with everyone behind getting a great draft from me. I entered turn one in about 7th. A few guys that had passed me went wide and into the grass, unfortunately one of them spun back onto the track and hit my left rear wheel. It forced me into a spin and to the back of the pack. I was coming back through the field until more contact left me without a front wing. The Juncos guys were on their game and I didn’t lose a lap while putting the new one on. So back to 16th I went, with only a few laps to go I managed to come back to 8th. Race two started a little better, I got a good jump on the start and only lost one position. I was running second for most of the race until a late restart. Once again going into turn one I got hit from behind forcing me to the back of the line. With two laps to go we went green and I was able to finish 8th again. In a way we were fortunate that I was able to finish both races but still very disappointing given our pace in qualifying. Just two weeks later we were back at it, this time on an oval. We were fastest in every practice leading up to qualifying. We knew we were fast on a single lap but our big advantage was being able to keep a good pace over a long run. I came up just short of pole position to Garret Grist. The first half of the race I was on his gearbox, I had a few chances to pass but couldn’t quite make it stick. It’s a very hard track to pass on because you have to use the low line to pass which has less banking and less grip than the preferred high line. We were side by side a few times! The car was really good. I was just taking my time because it was a 90 lap race, and I knew I would get a clean chance to pass. All of a sudden the steering was getting heavier and heavier. The car started to understeer a lot and bottom out entering the corners. It became a handful to drive and extremely tough physically to turn the wheel. I slipped back to third on the last few laps and had the fourth place driver all over me. Turns out my right front tire had gone down around half way which is the worst tire to have flat on an oval. We found a small hole in my tire after the race. Talk about some bad luck! That’s racing I suppose. Once again, it could have been worse so we have to take the positives away from the month. I’m still leading the championship which is the most important thing. In-between the two Pro Mazda races I went to Mosport to race for Alegra Motorsports in the Porsche GT3 Cup Canada Championship. The first race was going well, I was pulling away the first few laps but had to pit for a drive through penalty after jumping the start a bit. I finished 3rd in the second race. It’s a fun car to drive and I’m looking forward to the rest of the season with the guys at Alegra. The next Pro Mazda Championship race is at the Houston Grand Prix on June 27th-29th. Special Thanks to my supporters: Mockett, Rising Star Racing, California Scents, The Stutz, Vitamin-D Pro, OMP, RaceLite Protection and of course Juncos Racing.